Footprint Xchange, Left Brain, Right Brain. Highlights of another fabulous Xchange. Footprint Xchange is series of enriching events exploring future thinking within innovative design and technology. Design is at the centre of our lives…but is its true value recognised? 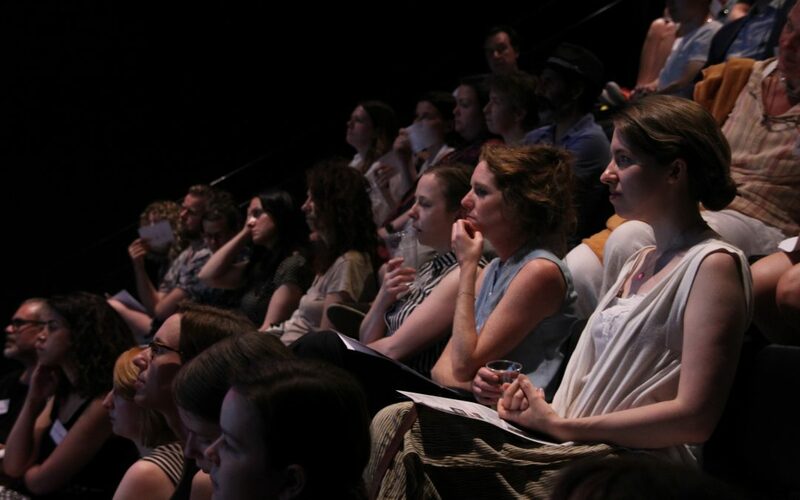 Throughout 2017 Footprint Xchange is exploring and debating these provocations across a series of events. Partnering with leading thinkers from the world of advertising, theatre, immersive technology, retail and branding, Footprint Xchange is at the forefront of the debate. Whilst it was acknowledged that many creative professions are currently not accurately categorised or fully understood by wider society, it is predicted that by 2020 businesses will be looking for employees who show 3 main skill characteristics, these being; Problem Solving, Critical Thinking, and Creativity, these being fundamental components of the creative professions we all work within. 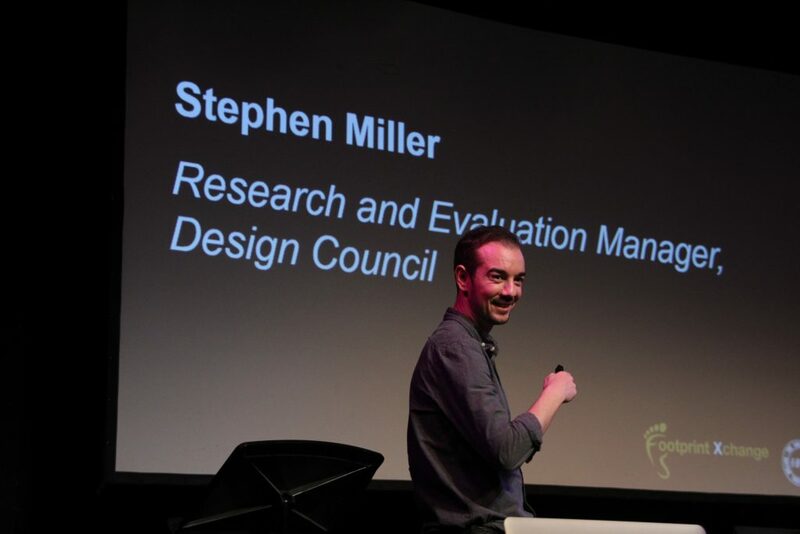 Stephen suggested that society will look to Designers and the creative industry as a whole to develop this sought after skillset. A closer look at ‘the dark matter of design’ continued with Pippa Nissen, Founder and Director of Nissen Richards Studio. Specialising in narrative spaces that include exhibitions for V&A, and the British Museum, her studio is now made up of around 22 designers with particular focus in creating immersive visitor experiences. Their design process involves graphics, 3D rendering, film and words – all combining to help bring authentic objects to life, and giving them a context – through their stories or intrinsic meaning. Footprint sits at the heart of where these worlds meet, bringing creative visions to life from concept to creation. Speakers Jim Rokos and Ab Rogers, co-founders of Dyslexic Design spoke about how Dyslexia brings unique gifts to the design processes. 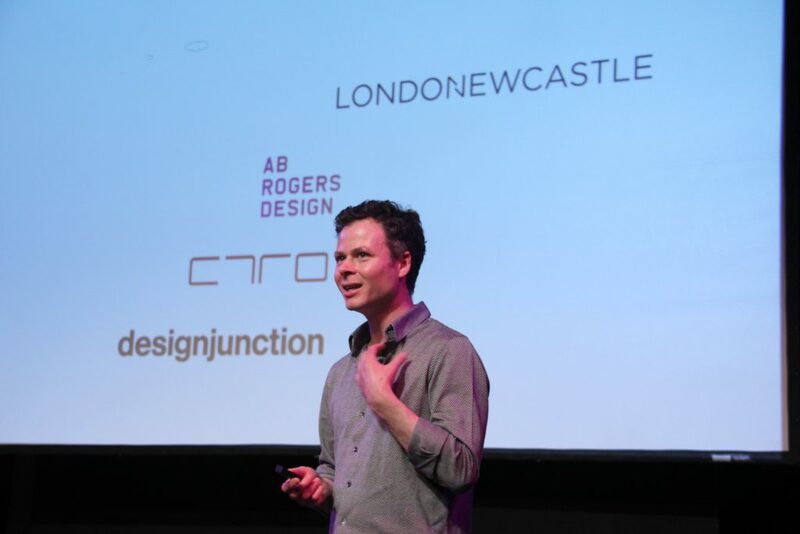 Product Designer Jim Rokos presented these to the audience through a series of artefacts taken from his recently curated Design Junction exhibition showcasing Dyslexic artists, designers and makers Lateral Thinking, Visual Thinking, 3D Thinking and ‘Over the Top Thinking’. GAUGE stems vase. 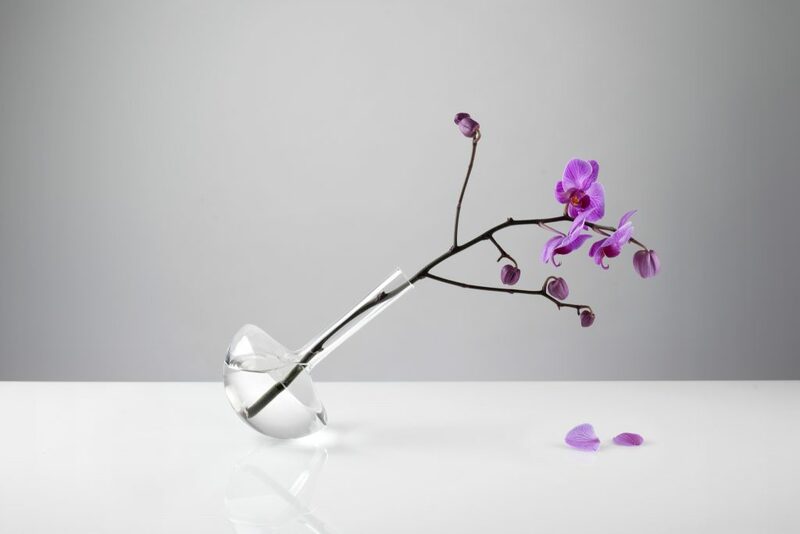 The GAUGE vase takes on the behaviour of the flower. The weight of the water holds the vase upright. The vase ‘wilts’ as the flower drinks the water, letting us know that it needs a top-up. This brings a playful approach to designing, where objects and spaces can express personalities and values, whilst being both practical and effective in use. They can take on the mood of the users, even being ‘shy’, ‘extrovert’, or a mixture of personalities… just as their end users! International Architect and Interior Designer Ab Rogers, Ab Rogers Design, discussed the idea of ‘playing with time’. In the context of visitor experience, exhibitions and museums traditionally dictate their narratives to be linear (in the form of timeline or carefully stepped story, supported by the curated subject matter). 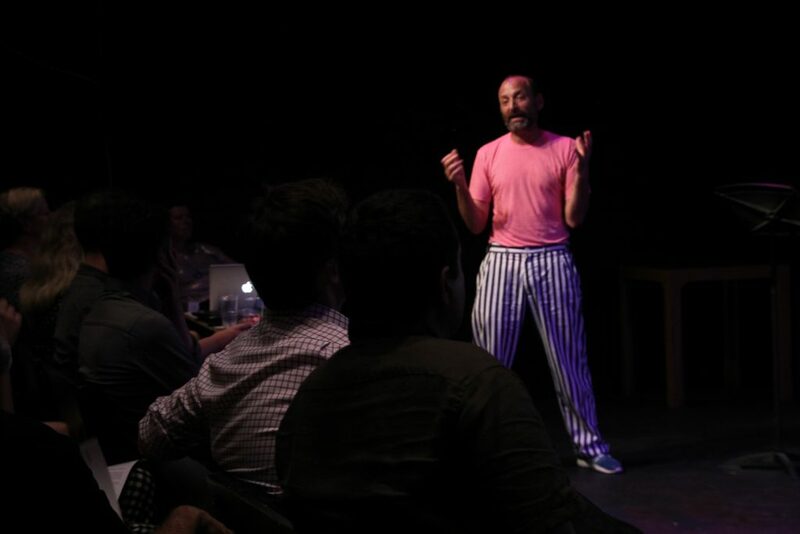 His unique design process turned the linear idea of ‘time’ upside down as he took us on an immersive, disruptive, and truly unique journey of A Day in the Life of Ernisto Bones, Stanley Picker Gallery. 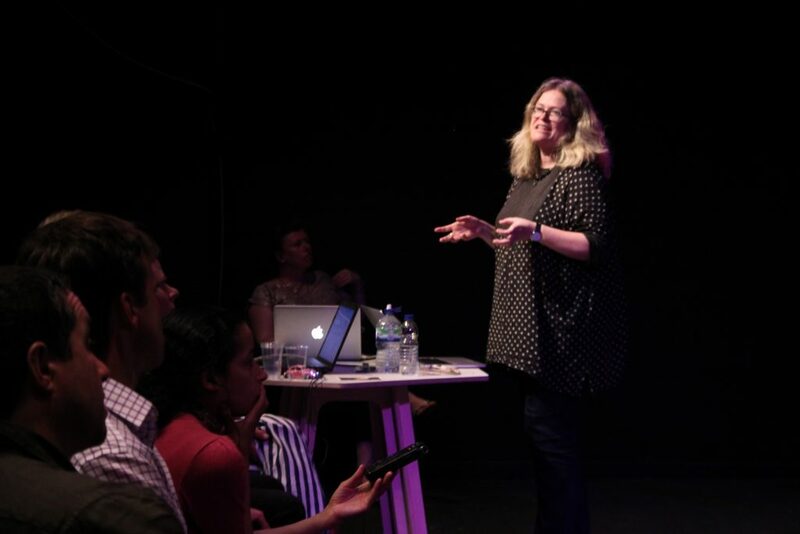 The evening then turned to wider discussion, with Fiona Watt (The Society of British Theatre Designers) facilitating an engaging debate regarding the Value of Design. The audience and panel exchanged views on the role and challenges of Education in providing an adequate foundation for ‘left’ and ‘right brain’ thinkers beyond higher education, and also went some way to dissecting the culture and challenges of unpaid pitching for projects… for which it was universally agreed that value and cost do not always align. 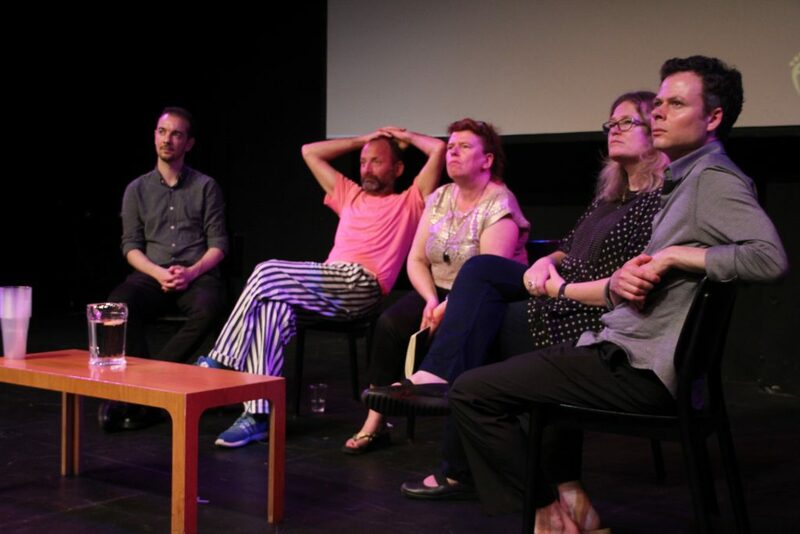 From left to right: Stephen Miller, Design Council; Ab Rogers, Ab Rogers Design; Fiona Watt, Society of British Theatre Designers; Pippa Nissen, Nissen Richards Studio; Jim Rokos, ROKOS. If you would like to attend our next Footprint Xchange event please do register on our Xchange page on our website, or if you would be interested in taking part and being a speaker please do contact xchange@footprintscenery.co.uk.